Doctor Who: Big Finish - RETURN OF THE ROCKET MEN | Warped Factor - Words in the Key of Geek. 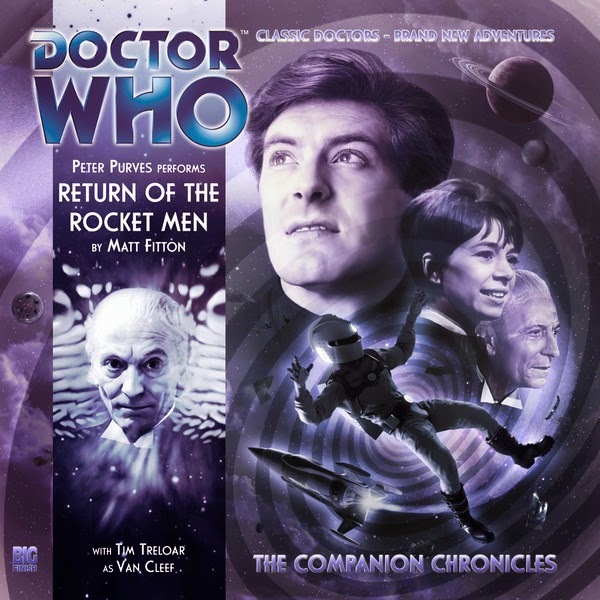 The first outing with the rocket men from Big Finish focused firmly on the character of Ian Chesterton, and in particular his asking of the question ‘When do you know?’ In Ian’s case, the question referred to Barbara, and when you know a person is indispensable to your happiness. It’s a brave addition to the character’s previously unspoken life from writer Matt Fitton, and we get the sense that this adventure is very close to Steven’s involvement with The Savages, where he finally answers that question and settles down on a divided world that needs a figure to bring the people together. The rocket man story thread in this adventure is rather less spacefaring derring-do than their first outing was, and rather more cleverly cyclical – Steven has run into the rocket men before, while working the freight routes, and he barely escaped with his life thanks to a bizarre event that he’s never quite understood. A miracle, if you like. Now as part of the time-travelling Tardis crew, he gets a whole new, sobering perspective on those events that helps him towards an answer to his question, without actually convincing him completely that the time is right to leave the Doctor behind. The beauty of the Companion Chronicles format was that they laid most of the storytelling burden on the shoulders of whichever companion was featuring in the chronicle, meaning that both William Russell and Peter Purves got a chance to show off their William Hartnell impersonations. In this outing Purves shows versatility in bringing his Tardis companions to life, then sinks into the reminiscence of the story. As with the original rocket men adventure, it’s Steven’s encounter with the rocket men that leads him both to contemplate the question that drives his character on, and helps deliver its answer. The writing here aims to advance the scope of the rocket men and personalize them rather more – Tim Treloar as Van Cleef is not a carbon copy of the first story’s rocket man leader, Ashman, with a more down-the-ranks feeling to the characterization, while maintaining a degree of cultural brutality that feels like a defining characteristic of what it takes to be a rocket man. There’s a great sense here too of the actual threat they embody to peaceful systems – while Ashman was a troublesome officer, we’re led to imagine a squadron of Van Cleefs and the damage they could do, which is a rather more visceral threat to the peace of mind. There’s a sense in this story too that all the River Song time travel spoilers malarkey of New Who is not just something that’s been invented or come into force in later regenerations, but that travelling with the Doctor was always enough to endanger your own personal timelines and the state of your mental health, as Steven’s new take on the events which helped define him as a young man now helps define the older, cleverer but less enthusiastic man he will be going forward. The sound design of this story is less whizz-bang 50s space serial than the original rocket men story’s was, but it still absolutely suits the kind of story being told, and this is the point – Fitton follows John Dorney’s original lead of making the spacefaring adventure secondary to the character journey in the rocket men stories. Ultimately then, The Return of the Rocket Men takes the original rocket men story forward, while also delivering a different emotional and intellectual tone, fitted to the character of Steven. It’s a strong entry in the Companion Chronicles range, and one that earns its place in your Big Finish collection.